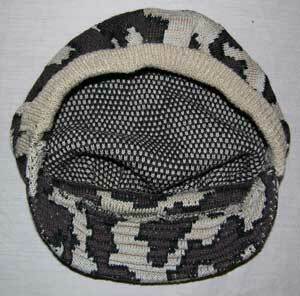 Winona Camo System© of the 1980's had a unique Ridge Runner Hat with a Soft Bill. March 2011 Update: We are honored and pleased to announce that The Knit Tree is licensed to Use the famous Winona Camo© Patterns and to recreate the Winona Camouflage clothing and accessories. We retired the smaller camouflage pattern shown in these Knit Tree photos below and substituted it with the more open and effective Winona Camo Classic©, Winona Camo Elite©, Winona Camo Snow© and Winona Camo Blaze©, all originated by Bob Fratzke. Watch for Knit Winona Camouflage Clothing and Accessories in our Online Catalog along with articles about Bob Fratzke and his Winona Camo© hunting garments. 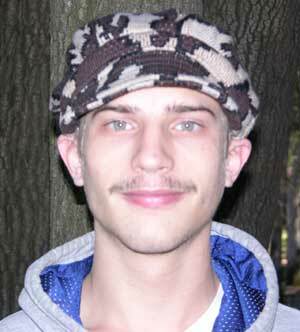 This article is to show the different steps that have to be considered in reconstructing a knit cap from a hat already assembled. 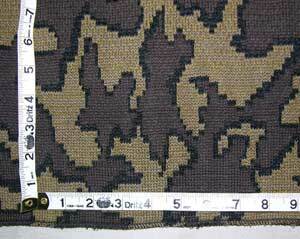 I am often contacted by hunters who have owned Bob Fratzke’s knit Winona Camo System© Hunting Clothing of the 1980’s. They comment that their Winona knit camo clothing is worn out or wearing out and in their search to find a replacement similar to the Winona Camo© they found The Knit Tree web site which offers Camouflage knit clothing. They comment that the Knit Tree's camouflage graphic design is very similar to what Winona used on their garments and that this design was the best in its day for hunting camouflage clothing. 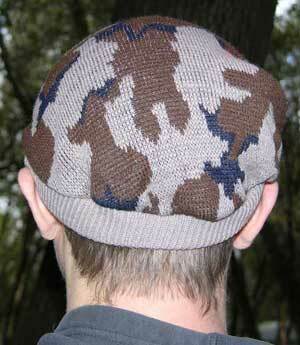 The silence of knit camo clothing is a highly sought after trait by hunters. These hunters read the articles I have written about designing knit camouflage clothing for customers and their specialized needs. This service attracted them to ask about other camo products that they would like to see added to the line of camouflage clothes by The Knit Tree..As these requests are designed and hand loomed they are added to our Knit Camouflage Clothing. To see the current Camouflage line of Knit Clothing and knit accessories available go to our online store and if you like what you see, bookmark our catalog to see when new items are added. Presently, all Winona Camo Knit Products offered by The Knit Tree have been approved by Bob Fratzke, originator of the Winona Camo. 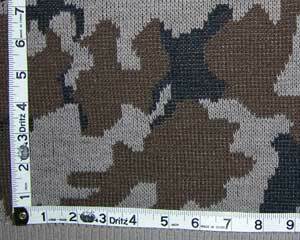 For more information, Please read my articles “Camouflage Clothing for Hunting and Knit Yarn Properties” to see this development process with the guidance and expertise of bow hunter, Matt Howe, the article " Compare Winona Knit Camo System to The Knit Tree's Knit Camouflage Clothing" to see the steps in reproducing the Winona hunting jacket classic cardi submitted by Grainger. 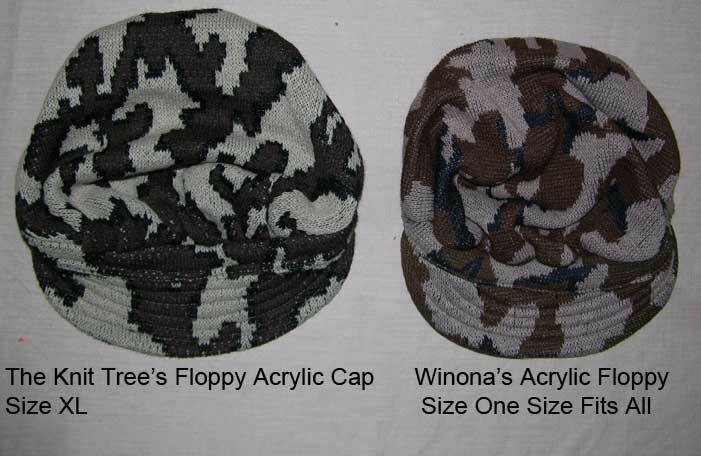 Click here to read the article about Bob Fratzke and the history of Winona Camouflage Knit Clothing and Accessories and the article Winona Color Ways show samples of the variety of Knit Winona Camouflage Color ways offered in The Knit Tree's online store catalog. “Winona Camo Classic© Acrylic Knit Ridge Runner Hat" is reconstructed by The Knit Tree. 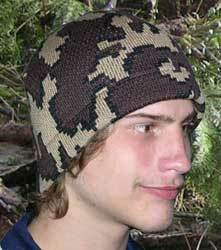 Ridge Runner knit Camo hat originated by Bob Fratzke. In January of 2011, Al Panicci, from New Jersey, called me to see if I could reconstruct the Ridge Runner cap originated by Bob Fratzke of Winona Knits in the 1980's. 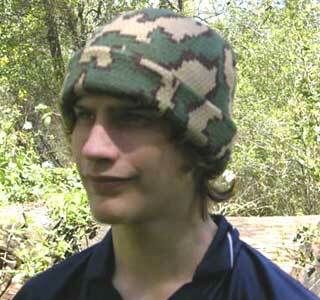 Al was already familiar with my knit Camo garments. 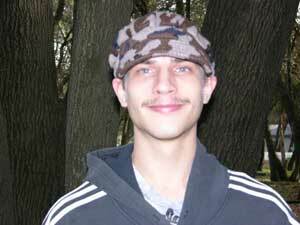 He had previously purchased the classic knit camo skull caps, raglan knit camo zipper jacket, knit camouflage cargo pants, and the merino knit camo boarder beanie throughout the past few years. Al generously offered to send his prized Winona Ridge Runner cap so I could examine it and see if I could reconstruct it along with a knit hunter blaze orange solid knit cap* in this body style. Being able to measure and examine Al's Ridge Runner cap enabled me to comply with his request and add the Ridge Runner Cap body style to The Knit Tree's line of Camouflage knit caps and beanies. Follow along with the knit analysis steps and photos below if you are interested in the process of 'how to design and construct a knit garment from a ready made knit' and to see how Al's request for the Camo Ridge Runner Hat became a reality. You will also understand that this could not have happened without being able to examine the original knit cap from Winona Camo©. 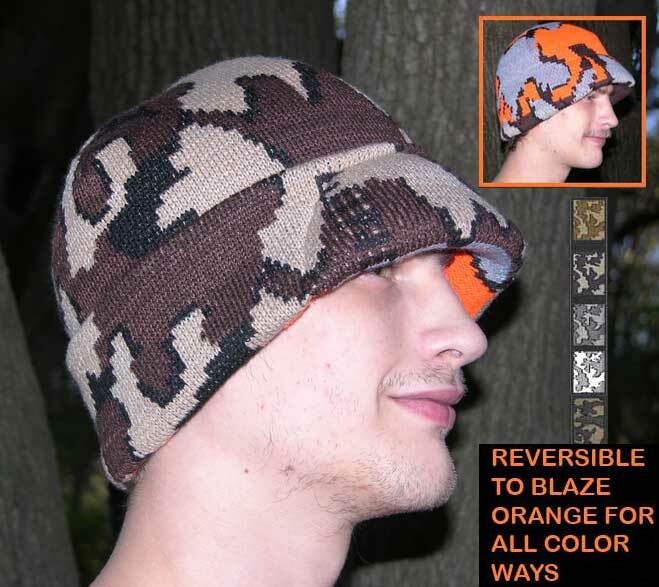 So everyone has Al Panicci to thank for the addition of the Winona Style of the knit Ridge Runner Hat to The Knit Tree's Camo Caps and Beanies. *Note: Update March 2011, Much appreciation goes out to Bob Fratzke for offering to send me samples of other items that he originated and designed in his Winona Camo line of clothing and accessories, so they can be reconstructed by Sharon Nani owner of The Knit Tree. Having Bob's critique and input is invaluable in this endeavor. 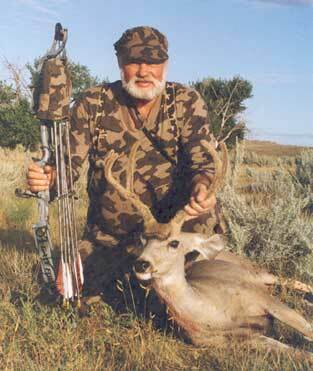 Bob Fratzke is 'The Master of Camo" and a Legend in Bow hunting. 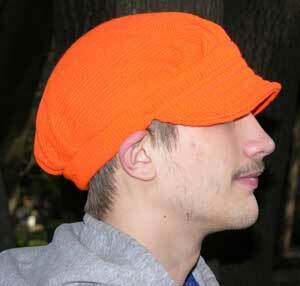 * Note: Some States require caps or garments be worn in hunter blaze orange for hunter safety. Refer to your states hunting rules to see if this rule applies in your state. The camouflage graphic design by The Knit Tree is very similar to Winona Camo Classic© and Winona Camo Elite©..originated by Bob Fratzke in the 90's, except it is smaller and not as open. 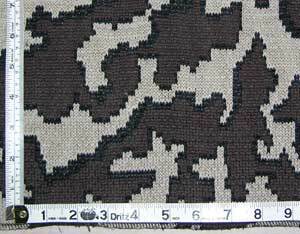 At the time I designed my camo, I had only seen garments knit with the original Winona Camo© which is shown below and was known as the Winona Brown Camo© The Winona Brown Camo© is a 3 color block design. 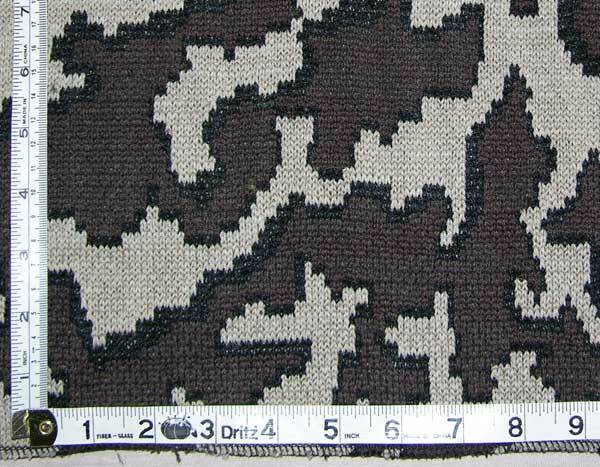 The Knit Tree camo design in this article is a 2 color block outlined with the black shadows. 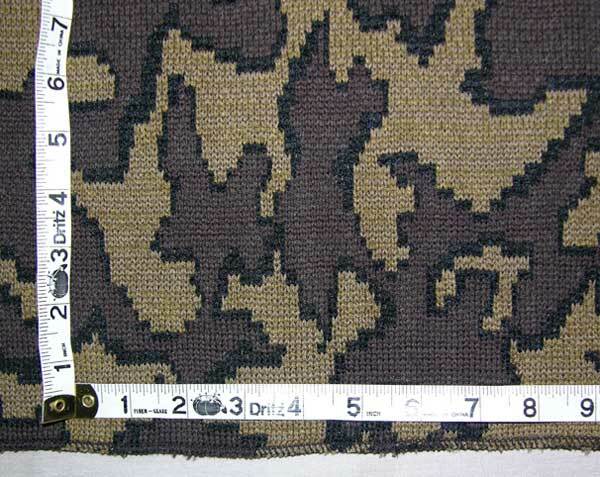 Read my article "Camouflage Clothing for Hunting and Yarn Properties" to see how the camo fabric and design was created. 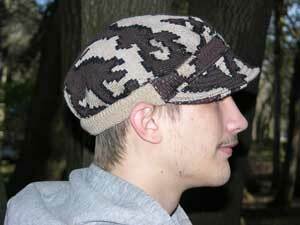 1. blend of silky merino wool and acrylic (% varies with style. Color Ways can vary every time a new dye lot of the same yarn is manufactured. 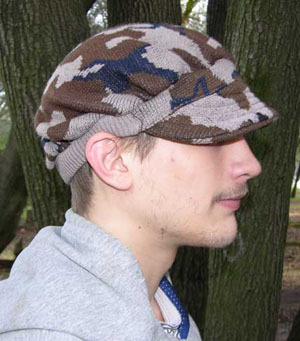 you can see that the photo of the Winona cap above varies from the swatch above (photo taken from the Winona jacket): in both cases, the lighter yarn is a shading of camel called taupe, the brown is in different intensities of darkness - the Ridge Runner cap having a red hue in the brown, and the jacket had a more yellow hue in the brown. The black in the cap had a blue tint in the sunlight, whereas in the swatch above has a highlight of more brown. The Knit Tree offers many color ways for all its knit camouflage items. You can even create your own by choosing from the available yarns. The big thing to note is that the same color of yarn in acrylic will look different in merino. Merino is a natural yarn with softer intensities. 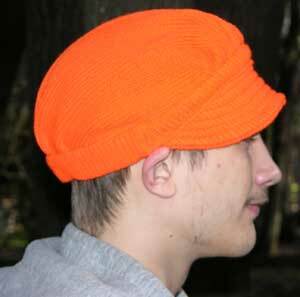 Therefore, the hunter orange Ridge Runner Hat is only offered in acrylic at this time, because the 'pumpkin' orange in merino would not met the standard of brightness required by different States Hunter Safety Rules. 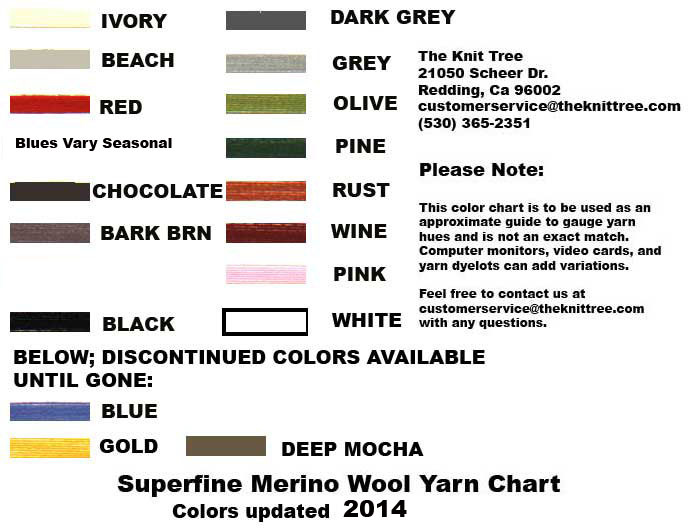 available colors for merino wool. standard color ways other clients have ordered. Both The Knit Tree’s knit camo fabric by Sharon Nani and Winona knit Camo system© by Bob Fratzke fulfill the characteristics desired by hunters of being SILENT and a graphic that breaks up the silhouette. The back ribbed band is meant to be the piece that controls the sizing because ribbing is resilient, meaning it stretches out and bounces back. With time in wash and wear acrylic ribs can loose this elasticity. 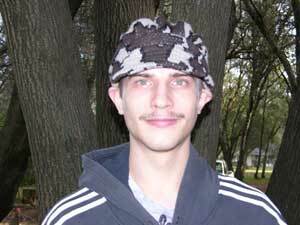 The sizing label says this Winona knit Cap is a 1 size fits all. The bill is reinforced by top stitching lines following the curve of the bill. Since these are custom knit caps and not mass produced, I serge around each individual piece to encase the cut edges. Then I sew the pieces together with a straight stitch sewing machine, so I can encase the serged seam allowances inside the hem - hiding the seam allowances and making a smoother seam surface against the head. Sewing with a straight stitch machine also gives you more control of where the top fabric is gathered. Taking advantage of modern day technology, I added lycra to the back ribbed band to maintain better elasticity through wash and wear. One could choose to have the brown back rib band if preferred over the camel. I added a 3/4" elastic piece inside the back ribbed band to regulate the differing head sizes. I offer a 1 size fits most (med/large) and XL ~ different sizes of elastic for different head sizes. 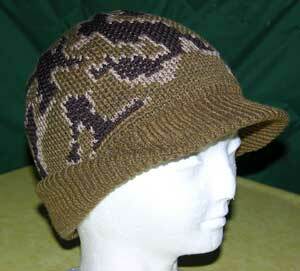 I plan to add a 'baby knit Ridge Runner cap' too since my baby camo line is popular. 1. The 'bill' pattern is easy to draft because it lies flat and the shape can be traced. A global 1/2" seam allowance is added to account for a. the cutting of the knit fabric b. the serging of the knit fabric c. the seam allowance of assembling all pieces together. 2. The front band and back rib band are rectangles, also easily measured and the global 1/2" seam allowance added to each piece. 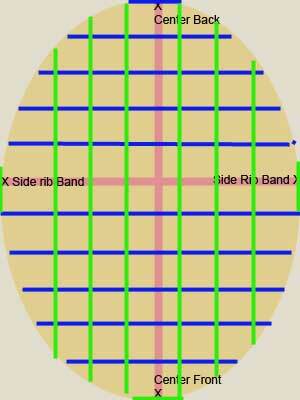 The rib band is 'knit to size' adding the global seam allowance of 1/2". d. connecting 'the measurement dots or lines' show you the curve - yellow oval on the pattern. As you see the closer you take the measurements, the more accurate your curve will be. I use a French Curve Ruler to connect the points instead of a straight ruler, which would give jagged edges. This paper pattern will be close enough for a 'first prototype', but because you are drafting from an already assembled curved cap and not a flat fabric piece that can be traced - final adjustments will be made after the first cap is assembled and tried on for fit. 1. Lay the paper pattern pieces out on the table to determine the smallest size of yardage necessary in length and width to knit all the necessary pieces (adding some extra for error) I determined I needed to knit a yardage of 26" wide and 15" length. 3. Notice that the first prototype did not come out correct for the Ridge Runner Cap Body Style. The bill, front and back bands matched but the top needs adjustments a. The top pattern had 'too much' fabric in the front, giving the look of the Biker Cap Style - not what I was after b. the blend of merino and acrylic material is heavier then the 100% acrylic cap that winona had manufactured - so to make a 'true floppy top' I had to make a lighter fabric. 4. Getting a pattern and drape of the fabric right takes patience, so it is back to the drawing board for some simple adjustments and knitting a 2nd prototype. 1. This time, to test the altered top pattern with less fabric, I decided to knit the acrylic camouflage fabric which is lighter weight like the original Winona knit camo Ridge Runner cap. 2. This pattern and weight came up to be very close to the original knit Acrylic Winona Cap of the 1980's. 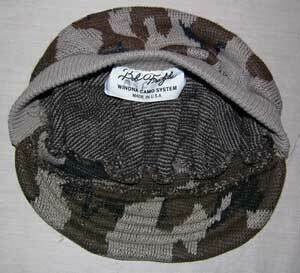 The Knit Tree's Ridge Runner Knit Camo Cap weighted 2.6 oz's. (with added elastic) compared to Winona's cap which weighed 2.2 oz's. 3. The weight and drape of both caps are comparable. So success in duplicating the Winona Ridge Runner Cap is achieved. 4. Now with the correct paper pattern, the samples are knit of each fabric to give the customer the choice of fabric they want, and all are offered for sale in The Knit Tree's online catalog. See Samples below. NOTE: The Ridge Runner body style has been called a 'news boy' or biker cap style by some companies. Below are 3 views of the Original Winona Camo© Ridge Runner hat originated by Bob Fratzke, manufactured in the 1980"s. This cap was sent in by Al Panicci to see if The Knit Tree could reconstruct the body shape applying its Camouflage design on the cap body style.. 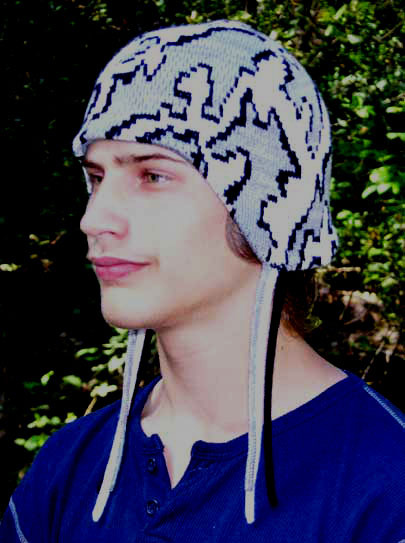 The original Winona knit cap was offered as a One Size Fits All in 100% Acrylic yarn. It had a finish weight of 2.2 ounces. 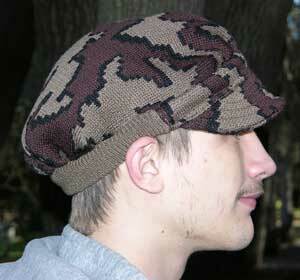 Below are 3 views of the knit Camo reconstructed Ridge Runner Cap by The Knit Tree, Sharon Nani. This cap is also 100% Acrylic, Color E: camel/black/brown. It is offered in 2 sizes: Adult: One size fits most (med/large)and XL. The finished weight of the acrylic fabric is 2.6 (added piece of elastic in the back rib band hem to control sizing). It has the same floppy drape as the Original Winona Cap. 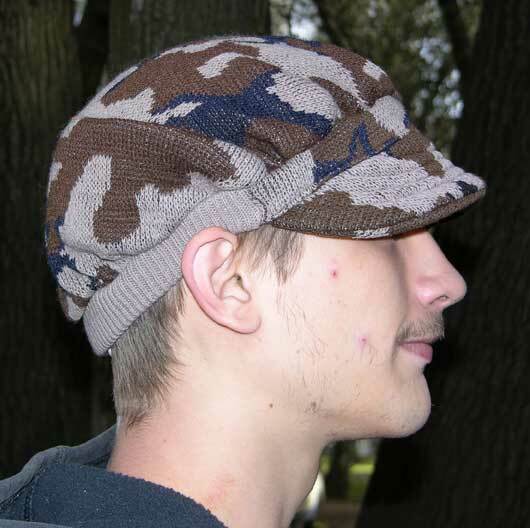 Click here to go to the online catalog to order the 100% acrylic cap: there are several camouflage color ways offered. 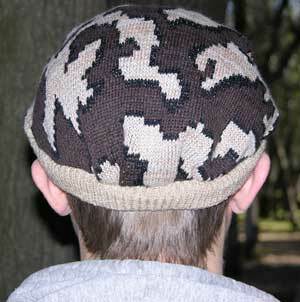 Below are 3 views of the knit Camo reconstructed Ridge Runner Cap by The Knit Tree, Sharon Nani. . 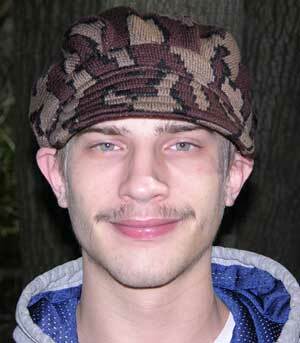 This cap is 66% Acrylic / 34% Merino Wool, Color E: camel/black/brown. It is offered in 2 sizes: Adult: One size fits most and XL. The finished weight of the acrylic / merino fabric is 3.6 ounces (added piece of elastic in the back rib band hem to control sizing). With the added merino fiber this cap would not be 'as floppy' in drape, but as you see from the photos, it pattern fits the head the same. 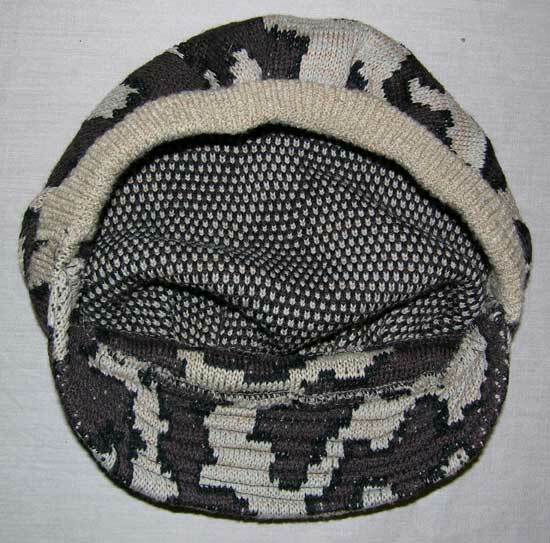 Click here to go to the online catalog to order the acrylic / merino blend knit Ridge Runner cap Elite Fabric: there are several camouflage color ways offered. 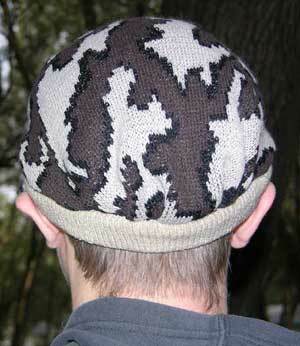 Below are 3 views of the knit Camo reconstructed Ridge Runner Cap by The Knit Tree, Sharon Nani. . 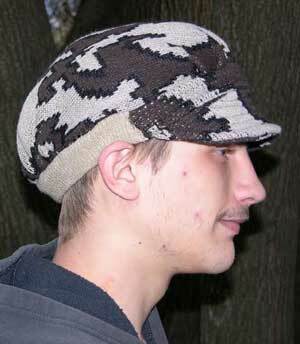 This cap is 100% Merino Wool, Color Q: Deep Mocha/black/brown. It is offered in 2 sizes: Adult One size fits most and XL. The finished weight of the 100% merino wool fabric is 4 ounces (added piece of elastic in the back rib band hem to control sizing). With the merino fiber this cap would not be 'as floppy' in drape, but as you see from the photos, it pattern fits the head the same. Merino has properties of moisture wicking, breath ability and is a soft and silky yarn. 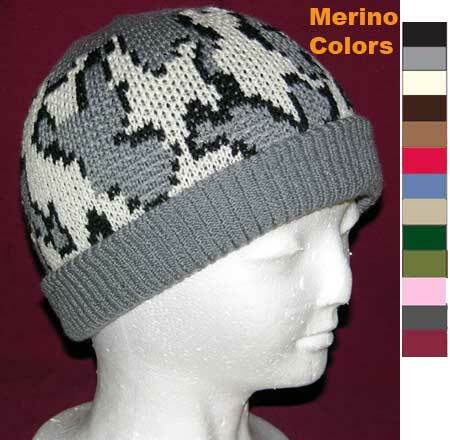 Click here to go to the online catalog to order the 100% merino wool cap: there are several camouflage color ways offered. Below are 2 different versions of the Solid Color Cap by The Knit Tree, designer Sharon Nani. Both caps are 100% Acrylic, Color Hunter Blaze Orange. They are offered in 2 sizes: Adult: One size fits most and XL. I hope this article answers your questions about how The Knit Tree’s Knit Camouflage Clothing and knit accessories are constructed and how this compares to the construction of the famous knit Winona Camo System©. The finished weight of the acrylic fabric is 2 ounces for the photo above, which is Floppy in nature and knitted with 1 strand of the yarn. (added piece of elastic in the back rib band hem to control sizing). It has the same floppy drape as the Original Winona Ridge Runner Cap. All these Floppy / News Boy Style Caps are using the same identical 'paper pattern' as the original Winona Camo© Ridge Runner Cap. What makes them different is the WEIGHT and FIBRES IN the fabric which is in the cap, this effects the drape of how the cap lies and feels on the head. The circumference of the FIT or SIZE of the hat would be the same for all because this is regulated by the front and back rib band. The finished weight of the acrylic fabric is 3.2 ounces for the cap Above, which is not Floppy in nature and knitted with 2 strand of the yarn. (added piece of elastic in the back rib band hem to control sizing). Since it is heavier, it would have more warm then the lighter cap, but a different feel on the head in drape.. The Winona Camo© was constructed by 'production techniques' with the availability of all the different kinds of sewing machine each specialized to do a task, and commercial knitting machines. The Knit Tree is a cottage industry which uses custom knitting techniques. We do use a industrial serger and a industrial sewing machine and domestic knitting machines. 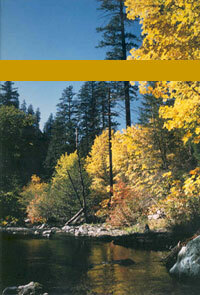 Watch for more articles showing the differences and similarities of the two construction processes. 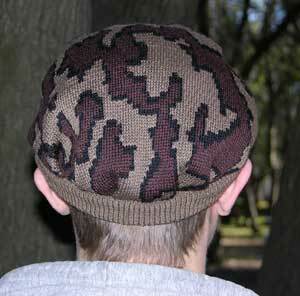 The Knit Tree offers several Camouflage Cap and Beanie Body Styles to met the different needs of hunters or just people that like camo caps. All of them are offered in a variety of colors and sizes. All are offered in acrylic, acrylic/merino blend, or 100% merino. Go to The Knit Tree's online catalog to see the wide range of camouflage beanies, sweaters, knit cargo pants , and even knit camo for babies. Check back often to see what other styles of knit camouflage caps and beanies are added to The Knit Tree's line of Camouflage Clothing.